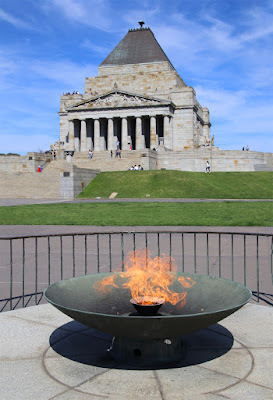 The Shrine of Remembrance is the National War Memorial of Victoria, a monument dedicated to all those who have served in the armed conflicts and peacekeeping operations in which Australia participated. Originally built in the 1920's as a memorial for the 89,000 Victorian men and women who served overseas in World War 1 and the 19,000 who made the supreme sacrifice. Although other monuments in the Shrine Reserve commemorate later services, the Shrine itself now honours all men and women who have served. It belongs to yesterday, today and tomorrow. As we arrived at the Shrine the first area we came across was one of the courtyards. 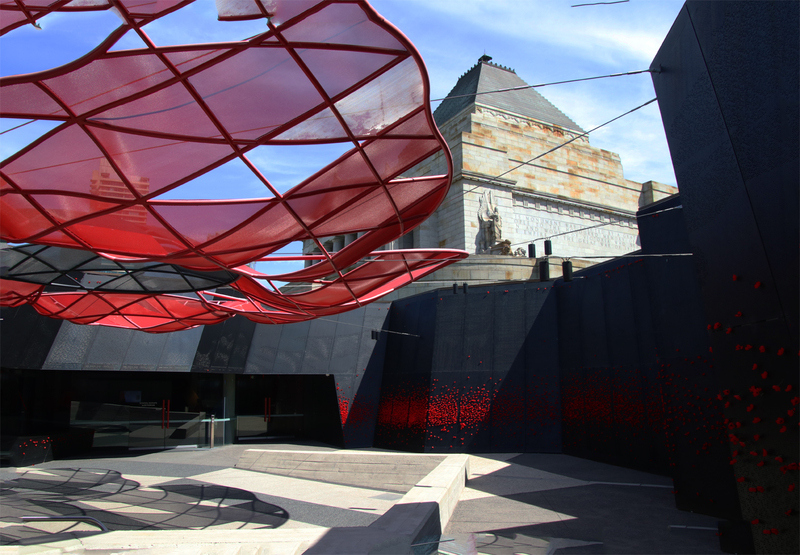 This courtyard was black walls with many many red poppies poked into holes and what looked like a huge poppy suspended above. 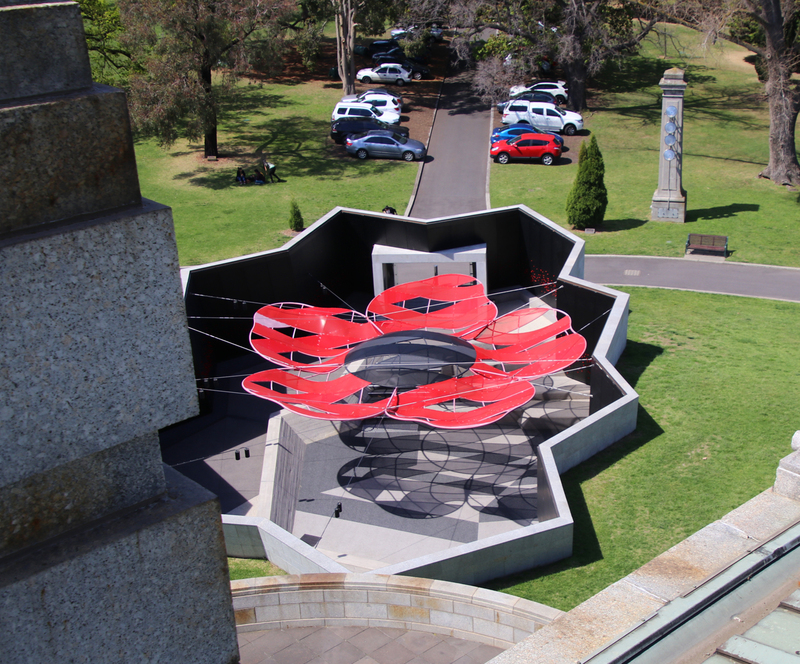 It wasn't until we could view the poppy courtyard from above that we could see the beauty of the suspended poppy. 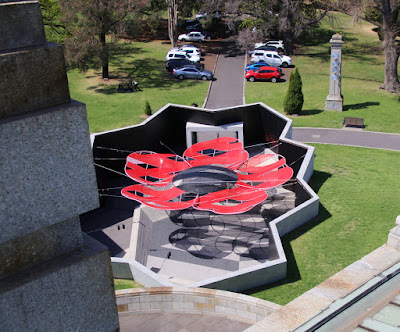 Our tour guide also informed us that the thousands of holes in the black walls that all the poppies were stuck into actually said the "Ode to Remembrance"in morse code. 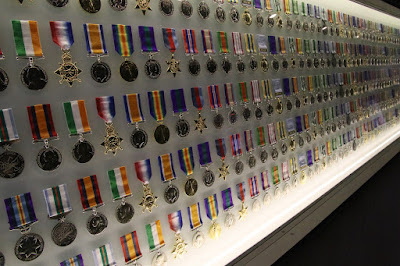 At the entry of the Shrine we were confronted by the Gallery of Medals. 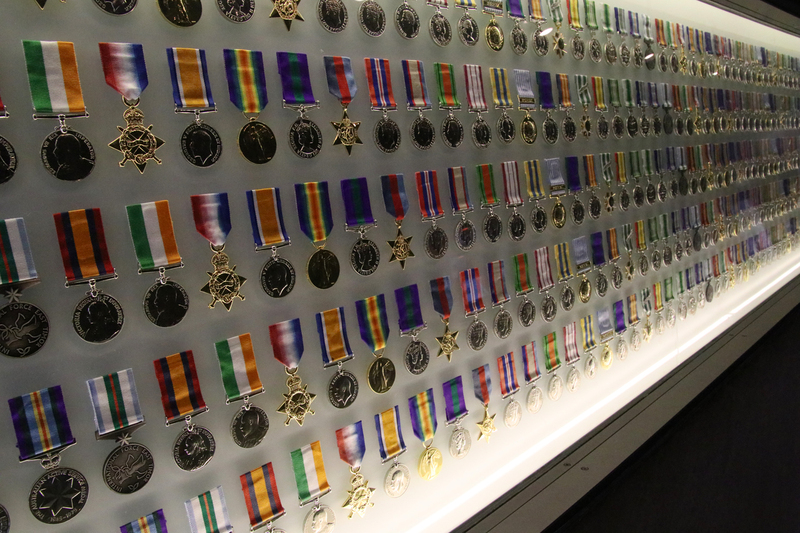 This wall of medals certainly emphasises the scale of Victoria's service since World War 1. 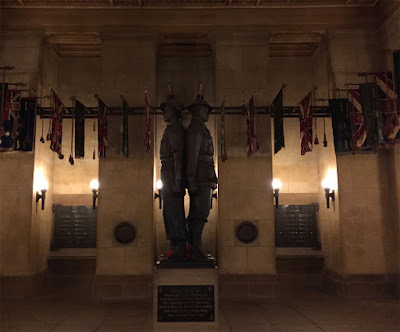 This hallway exhibits over 4000 replica service medals since the Boer War. 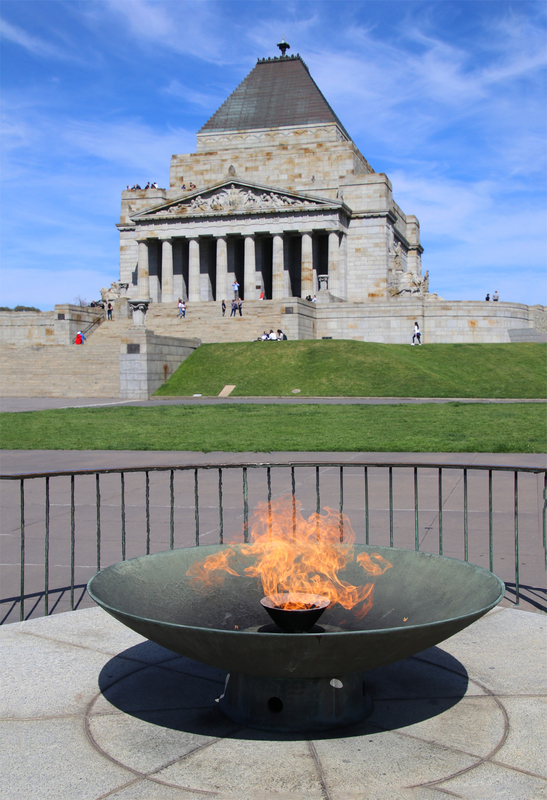 Each medal represents one hundred Victorians who served in armed conflicts and peacekeeping operations. 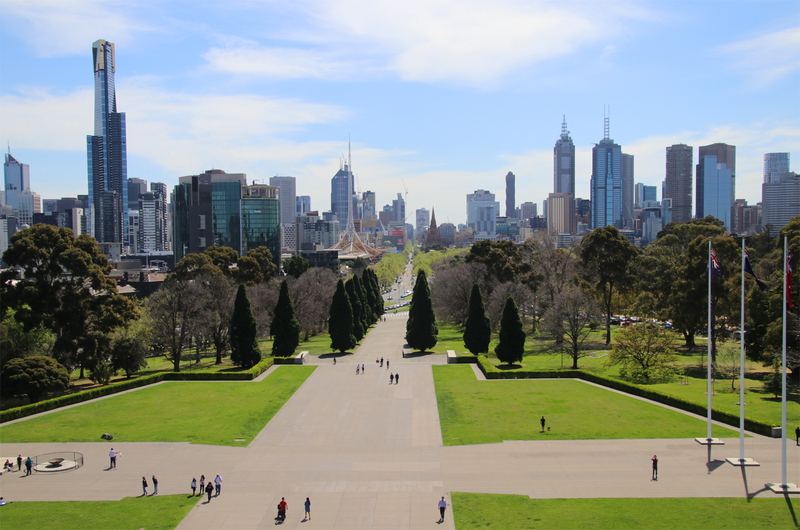 Standing on the second floor balcony you get the most amazing view of Melbourne's CBD. 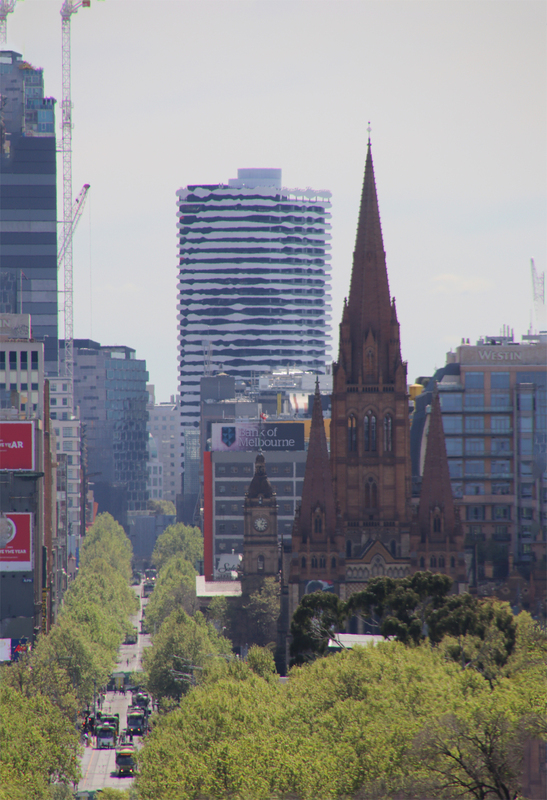 Can you see William Barak? Looking northward up along St. Kilda Rd and Swanston St. you can see the majestic St Pauls Cathedral. Beyond the Cathedral you can see a newly built striped building. Without our extremely knowledgeable tour guide we would never have noticed the magnificence in front of us. Can you see it? Constructed into the balconies of the apartment building is the face of the Wurunjeri elder William Barak. 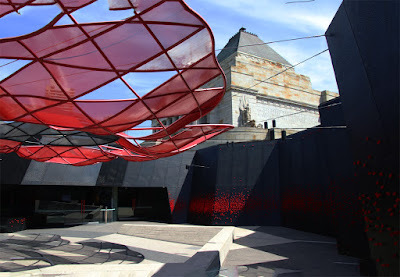 Not only was William Barak an elder of the Wurunjeri, an artist he was a social justice leader. We were absolutely amazed at this beautiful acknowledgment of a great Australian from a private building. 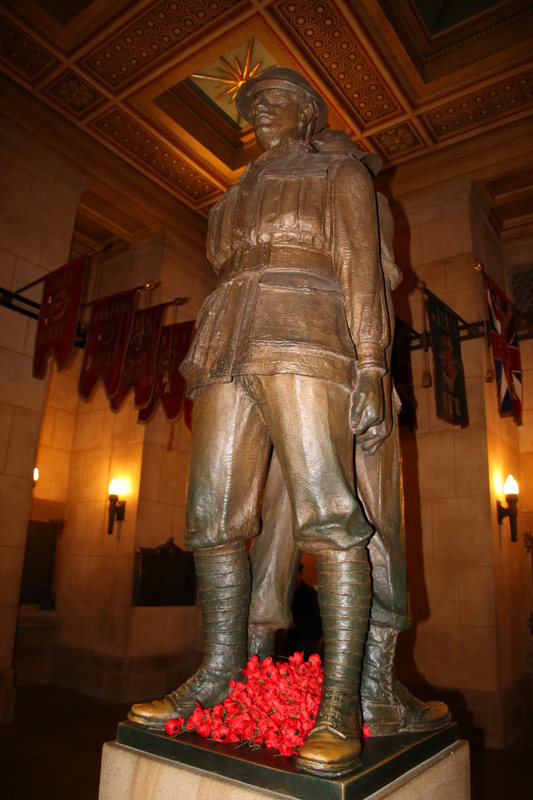 Centrally placed in the crypt is this very powerful sculpture "Father and Son", with this inscription. Captain Kenneth Parsons,2/3 Motor Ambulance Convoy, removed this union flag from the Sultan of Johore's palace in late January 1942 to prevent it from falling into Japanese hands. After Singapore's surrender on 15 February 1942, Parsons and the other Australian medical officers concealed the flag for the entire three and a half years of their imprisonment in Changi. 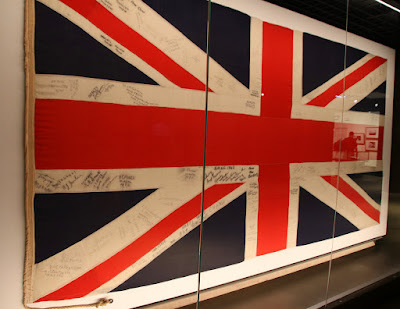 Between 1942 and 1945, over 100 signatures were placed on the flag. 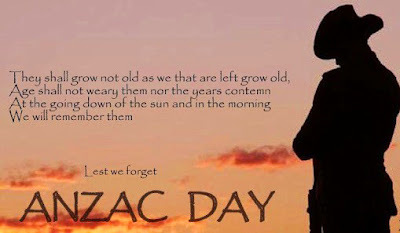 Of these, 91 are Australian, including 33 Victorians, 36 New South Welshman, 16 Queenslanders and 2 Western Australians. 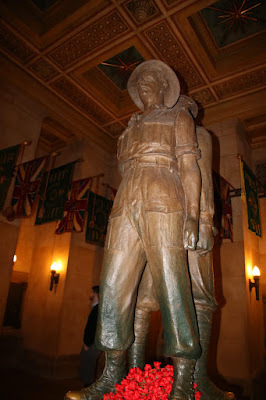 The rest are attributed to members of the liberating forces. 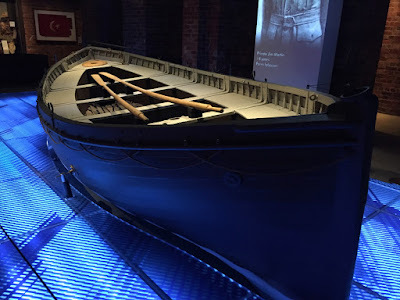 The "Devanha" landing boat is the last remaining of the six landing boats that ferried ANZAC troops to the beaches at Gallipoli on 25 April 1915. 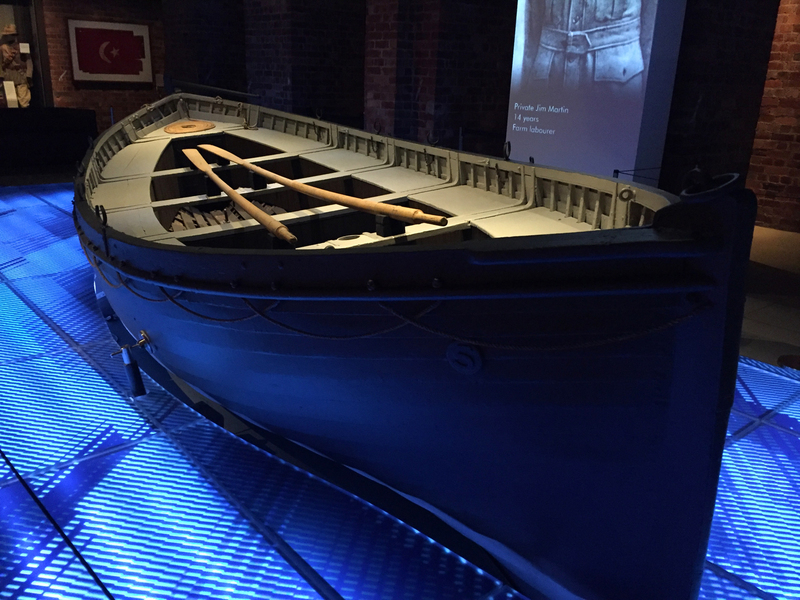 I must admit standing beside this amazing piece of history I could almost feel the spirit of the men aboard. 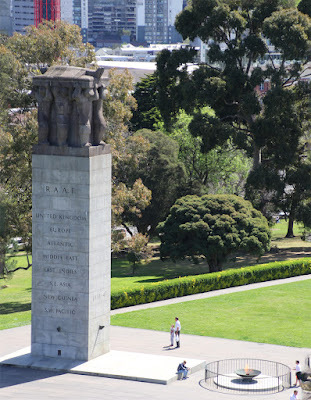 Remembrance Garden - Post World War 11 Memorial. Although a small out of the way area, this is a lovely peaceful spot and sit and appreciate all we have. 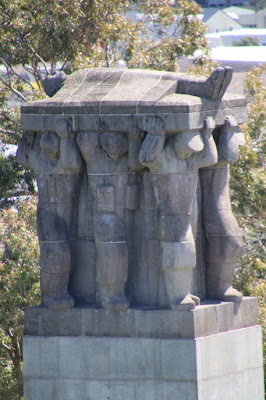 The Hall of Columns is part of the original substructure of the Shrine. 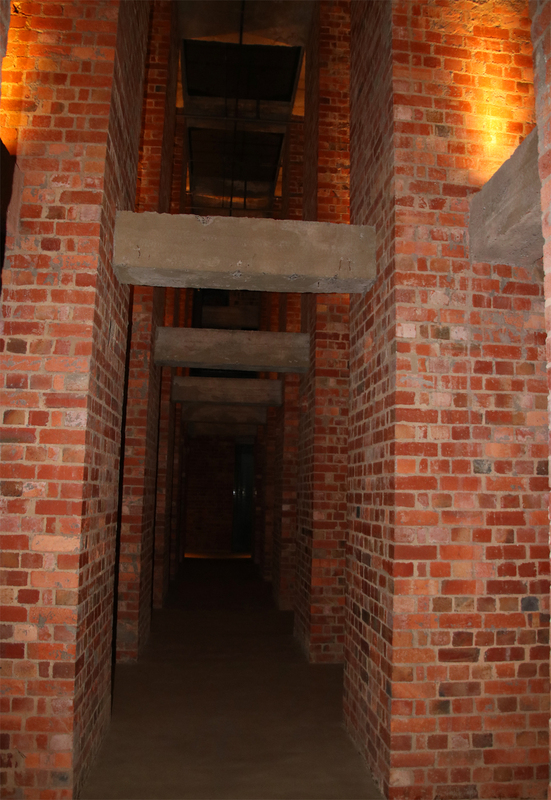 Approximately four million bricks were used in the construction of the columns to support the original structure. This area has now been opened up to the public and with it's subdued lighting and many many artifacts it gives an atmosphere of contemplation. The World War 11 Memorial, which includes the Forecourt, Cenotaph, Eternal Flame and flagpoles, was built to commemorate all Victorians who served in World War 11. I've never been one for war stuff but I am so glad I included The Shrine in my adventure days. 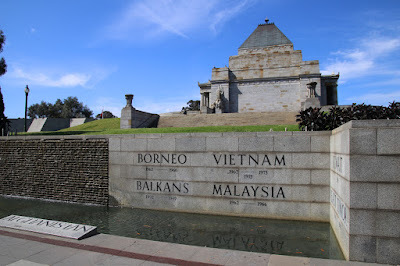 I learnt so much about some pretty sad history. War is a terrible terrible thing and these days we don't know from which direction it is coming. I don't have a solution, all I can do as one person is love and treat all other humans with kindness and compassion.